1. Cook ravioli until al dente (follow directions on the package). Cool. 2. Heat oil to approximately 350 degrees. 3. 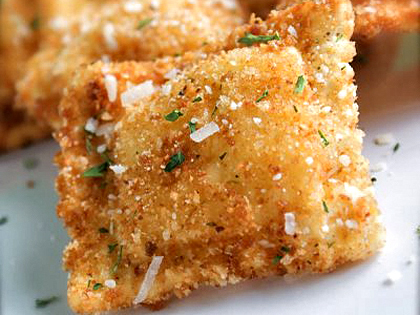 Dredge ravioli in buttermilk and then bread crumbs mixed with half of the Parmesan cheese. 4. Gently place into hot oil and fry until golden brown, about 2-3 minutes. 5. Once ravioli are browned, sprinkle with remaining grated Parmesan cheese.